You look at your lawn through your window, and you see a green layer covering and beautifying your backyard. But what’s hiding beneath this impressive green blanket? Whether you see them or not, there are lawn enemies all around, and they are not all lawn pests. Lawns might get damaged from several sources. How can you fight them? 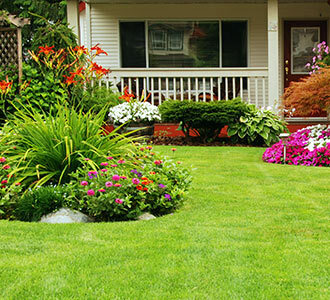 The first step is providing landscaping maintenance services for your Toronto property. The second step is finding out more information about the lawn problems and learning how to get rid of them. With the proper lawn care tasks including frequent inspections and finding the right treatments, you will be able to keep lawn enemies away from your property. Knowing which enemies are in your lawn is the first step towards discovering the correct treatments. 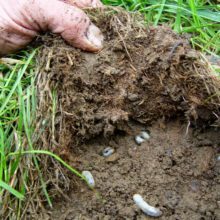 Grubs: These six-legged little yellowish or white creatures eat the lawn roots turning your grass brown before it dies. Chinch bugs: These black and white bugs love the sap of the lawn plants and feed on it. Snails and slugs: these little species feed on roots, plants and garden vegetables. One piece of advice: Don’t use pesticides because they kill earthworms, which are beneficial to your tiny ecosystem. Don’t over-water your lawn. If the lawn remains wet for prolonged periods of time, chances are that it will get infected by a disease. Before you grow your lawn, make sure you choose the right grass for the local climate. Most fungi grow in warm environments, but some also thrive in cold ones. Check with your local landscape experts, who could also give you some landscaping maintenance tips. Be extra careful with fertilizing. Testing your soil, getting the right fertilizers, and applying them properly all ensure that the lawn will not be infected by diseases. Mow the lawn, especially before it snows. If long grass is covered with snow, it will bend and keep the moisture under the snow blanket. This would be the ideal environment for fungus to grow and spread. Clean the debris formed by tree leaves. They hold moisture and keep nutrients from entering the soil, creating the ideal environment for fungus. It’s important to check your lawn regularly, and that’s why landscaping maintenance services in Toronto are essential. 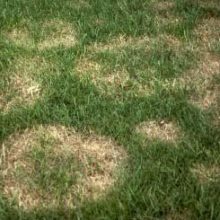 If you see any discolouration on the lawn, like brownish or yellowish rings, there is a fungal problem. If the stems of your flowers change colour, it’s also a sign of disease. If parts of the lawn look greasy, they are also infected. There are fungicides on the market that will help you keep control of lawn diseases. The best lawn care method is prevention. That’s why you should run soil tests often, aerate the lawn, water as much as needed, clean the grass, mow frequently, and fertilize as required. Remember that sometimes lawn enemies are created out of nowhere. If you walk on the lawn when it is covered in snow, you will unwillingly create the required conditions for fungus growth. But if you cannot prevent lawn diseases, at least fight the enemies as soon as possible. And for that, you need the experience, regular inspections and professional treatments of Toronto landscaping maintenance specialists.